Want to get away, but have never hunted in the state before? Have you always suspected there’s another plot of public land just a little farther down the road? Or are you daydreaming of one day hearing the bugle of an elk call, but right now you can only think of the bugling from the kids down the hall? Look no further. I’ve compiled the best interactive maps from all fifty states. I’m constantly trying to keep this list up to date so that you can plan your hunts from the comfort of your chair. Some states don’t have interactive maps, or I was unable to find them at the time of this writing. For those states I’ve linked the more traditional PDF maps or georeferenced pdfs. Please confirm with the DNR in your hunting area to ensure that the lands are still open to hunting before setting foot out into a new piece of public land. Map based on hunter survey results with heatmap! Couldn’t find any interactive maps. Not really well integrated, but a good effort. Interactive ArcGIS Enabled Map… embedded as a frame, for less pixels! Woo, have to zoom in to make anything make sense, but they invested in their own little app. It takes some getting used to, but there’s a lot of pretty granular information there. High Resolution LiDar based topo maps? Yes Please! Traditional Maps — They list 1400 WMAs. Are you serious?! The Hunt Planner application, suffers from being too busy when zoomed out, but it tightens up quickly and looks great. Comment: I went to their official website where they claimed interactive mapping was coming online in 2013. Uh…. ArcGIS Web Map, they loaded it with useful information like shooting ranges, boat ramps, WMA boundaries. Awfully pretty as far as maps go. Choose Hunting or Shooting. The hunting map calls out specific types of game, and is easily filtered. Looking for a specific type of biome in Oregon to hunt? This map has it. This is what got me started on this kick, realizing my home state had an awesome interactive map! ArcGIS Interactive map with boundaries of WMAs, several direct webpages linked when you click an WMA of interest. They have an ArcGIS Map that appears to have never been set up? They have their own GoHunt! Application that looks pretty well thought out. 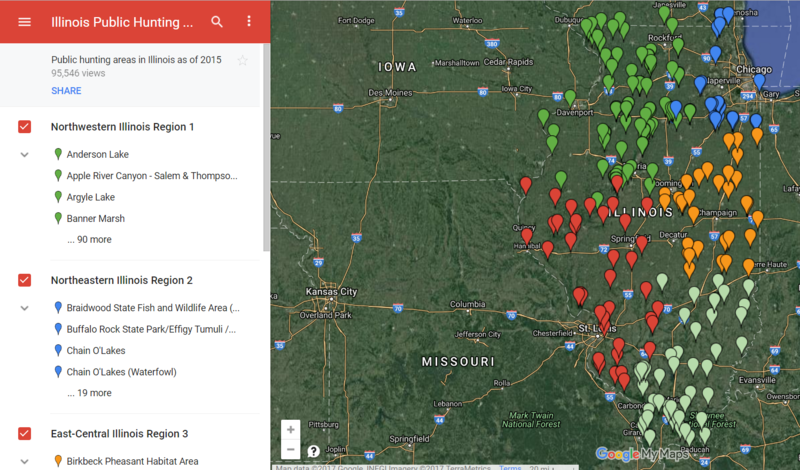 Search by species type, release sites for Pheasant stocking. There’s huge amounts of information here. This is a real standout. Acreage is counted, as is the permission type on Private/Public coops. If only they did the same thing for fish… OH WAIT, they did. Their maps are broken down by resident and non-resident as well as species. Here is non-res deer.